Many wineries are now adding greenhouses to their properties, as they are excellent for grape growing. Most varieties of grape vines are more successful when they are grown indoors and under glass as opposed to the outdoors. They do require much attention however, and with consistent watering, feeding and pruning you can be assured of a healthy crop year after year. Because of the way grape vines trail they have a tendency to monopolize space if they are not kept under control. Therefore, they should be planted along the inside wall of the greenhouse on the opposite side of the door. The best times to plant grape vines are in late fall when they can be cut back without bleeding. 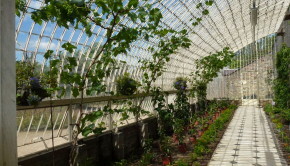 In certain regions, it is common to grow the roots on the outside of the greenhouse with the vines trailing inside through a hole in the structure. Although grape vines do well in cold weather, if temperatures are regularly below freezing, you should plant them indoors just to be on the safe side. Grape vines should be planted around three feet deep into fertilized soil. Water regularly directly to the root of the plant never allowing the soil to become dry and every three to four weeks add fertilizer to keep the plant healthy. As the vines begin to spread it is suggested that they be trained to grow up toward the roof of the greenhouse. As they achieve some height, you can allow the side shoots to expand. You will need to secure the shoots to trellis wires which are beneficial to the plant because it allows the grapes to hang loose ensuring they get appropriate sunlight and water spray. There are two different methods for pruning grape vines; spur pruning and cane pruning. It is suggested that the first year of growth be left alone. Spur pruning – leave two shoots to grow below the tip of the trunk and pinch out the tip. Cane pruning – pinch off the main stem when it grows above the top of the trunk reducing the canes that produced fruit to two buds. One of the few disadvantages of growing grape vines in your greenhouse is that they typically attract disease if you are not careful. It is necessary to adhere to a strict disease and insect control plan.